SkyTeam has partnered with global car rental company, Hertz, becoming the first airline alliance to offer car hire benefits to Frequent Flyers plus the opportunity to earn miles when renting a vehicle. 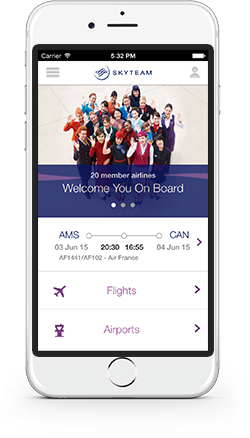 As part of its continued focus on providing the best multi-airline experience in the industry, SkyTeam has made it easier than ever for top frequent flyers to share their feedback and suggestions when they travel via its SkyPriority Audit app. SkyTeam, the global airline alliance has launched a new metasearch tool on its website making it easier for customers to plan and book trips on all 20 member airlines. In an effort to learn more from our passengers, SkyTeam has formed the “Jet Setters” research community. SkyTeam, the global airline alliance, has named Kristin Colvile as its new Chief Executive Officer. The appointment was confirmed today at a meeting of the alliance’s Governing Board, which is composed of CEOs and Chairmen of the 20 member airlines. SkyTeam, the global airline alliance, has reached a milestone in the development of advanced technology enhancing its current tech hub with new functionalities. SkyTeam, the global airline alliance, is making it easier for frequent flyers to use their miles to book reward travel across multiple member airlines. An online booking tool is putting customers in control of their own trips, by displaying available flights in real-time and offering greater choice. Global airline alliance, SkyTeam, has launched a series of digital maps to help customers breeze through its global hubs, as it continues investing in technology to enhance the airport experience. SkyTeam, the global airline alliance, has launched SkyTeam Rebooking, an innovative technology solution designed to reduce inconvenience caused to customers by flight delays, cancellations, and diversions. Global airline alliance, SkyTeam, made traveling to see family and friends for the Lunar New Year celebrations extra special at Vancouver International Airport. Global airline alliance, SkyTeam, has announced two new branded lounges: one in Santiago, Chile and one at Istanbul’s new international airport.